Using your caravan for the first time after winter is always an exciting event, but it’s important that you check for any signs of damage that may have occurred over the winter period. 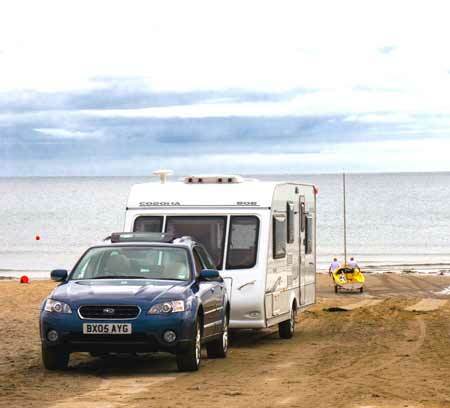 This article highlights some common claims that we receive plus some typical caravan problems and then gives tips on how spot the warning signs so you can prevent damage or issues which could spoil your first trip of the year. If you need advice on how to prepare your caravan for winter then have a read of our caravan winterisation article. One of the first things you should check are your caravan tyres. As an insurance specialist we receive hundreds of tyre related claims each year, many of which are major road accidents following a blowout. As you may know, it’s important that you rotate your caravan’s wheels periodically over winter so that the weight isn’t concentrated on one section of the tyres over a long period of time. Of course this may not always work to protect your tyres completely, so it’s important that come spring you check your tyres carefully for signs of warping, cracking or bulging and top up the air pressure to the manufacturer’s recommended level. We have issued in depth advice on caravan tyre maintenance in a previous article. It’s also a good idea to check that your caravan’s wheel nuts are properly tightened and that there aren’t any signs of rust or heavy wear. Damp is a caravan’s biggest enemy as if left alone it can quickly cause a huge amount of damage, making it vitally important you spot the telltale signs as early as possible and deal with the problem quickly. Check around windows, doors and skylights for signs of any leaks and also give all upholstery a once over for signs of damp. Your nose is as good a gauge as your eyes for spotting damp, so make sure you keep a nostril out for a fusty, musty smell as this is a big indicator that there is damp or mildew around! Spot the damp early and it can generally be fixed with a dehumidifier or even a few hours of fresh air circulating. It’s important to test all of your security equipment is in full working order before setting out on your first trip of the season. Check your alarm still activates via its door or window contacts, PIR or tilt sensor and check that the siren is still audible. For those of you with tracking devices fitted, it’s also worth towing your caravan a few miles away away from its usual storage position and then calling the monitoring centre of your tracking company to make sure they can get its location. You should also check physical security devices such as your wheelclamp and hitchlock are not showing any serious signs of wear or damage, and that they can be fitted and removed easily without any seizing or sticking. Fire related caravanning claims were on the increase last year, so if you haven’t already it’s well worth investing in a fire extinguisher so you can tackle a small fire should it break out in your caravan. A multi purpose dry powder fire extinguisher suitable for A, B and C class fires can tackle most small fires you would get around your caravan such as those involving fabrics, woods and butane or propane gasses. Note that fires from cooking oils and fats are F class fires so are not to be tackled with an ABC fire extinguisher, therefore a fire blanket is great to have to throw over small cooking fires. And if you do already have a fire extinguisher in your caravan, be sure to check the expiry date to ensure it is still useable and then replace if needs be. Of course if the fire is large and spreading quickly don’t try to tackle yourself, just get all occupants out of the caravan to safety asap and call the fire brigade. It can be difficult to remember when the renewal dates are for all the different services you make use of when caravanning, with things such as your caravan insurance, car breakdown, tracking device subscription, travel insurance or even your passport all being things that need to be checked and renewed when appropriate. You don’t want to be sorting these things out when you’re on a trip. To make life a lot easier we recommend taking ten minutes to write all of the different renewal / expiry dates down on to one piece of paper, and then keep a copy of this in your caravan, and a second copy in a convenient place at home. That way, you can check at a glance when something is coming up for renewal and ensure when you hit the road you are still fully covered. Keeping your caravan clean on the inside and out will help to prolongue its life and keep it in tip top condition. This is not only important for the enjoyment of your caravanning holidays, but also means that if you decide to change or upgrade your caravan then you will get a much better price when trading in, or selling on privately. We of course recommend getting your caravan serviced every year to ensure no issues surface whilst on the road or on a campsite. Of course caravan dealerships and service centre workshops get busy at this time of year so if your ‘van is due a service before your next big trip be sure to get it booked in early. After reading your article servicing your caravan which I agree is most important and preferably done by a professional. This is where I have a problem. We have a Bailey caravan with a 10yr warranty and nearly 2yrs old,is now due for a service. I am told it will cost £300 and has to done as the warranty will be void unless completed. We took advice from the National Caravan Council on this Roger. They suggested to check if the mobile service engineer is enrolled into the NCC Approved Workshop scheme. This will mean that the service engineer is subject to an annual independent assessment to ensure they continue to meet industry standards and best practice. Employing an approved workshop will also protect your warranty as Bailey fully supports the scheme. Visit http://www.approvedworkshops.co.uk to check if the mobile service engineer is enrolled. With reference to the Fire Extinguisher mentioned in your article. Most of these extinguishers are filled with Dry Powder, it is a good idea to remove these from their bracket (6 monthly or before every journey) and give them a good shake. the powder settles and can become so solid that when you go to use it nothing comes out. There is usually a pressure guage mounted on the neck mof the extinguisher, this should be well into the green area or towards the top of the green. If it is at the bottom or going into the lower red area replace the extinguisher. Personally I prefer a Co2 extinguisher, a bit more expensive but a lot less messy than dry powder. If you use a dry powder extinguisher get out at least until the powder has settled, nasty stuff, you will be cleaning it up for the next six months. A bit like exploding a very large tin of talcum powder! David A – What you say is absolutely right, and I would agree that if you walk in to a caravan and there is an instant and obvious smell of damp then there is clearly a serious problem. In the article, when we refer to smelling damp it is on specific items and a smaller scale. i.e. Moving a cushion or opening a cupboard and it having a damp or fusty smell for example. In minor cases like this the actions outlined in the article will generally be effective. David C – Caravan Guard are caravan and motorhome insurance specialists. If you have had an insurance quote from us for your caravan or motorhome and provided an email address then you will recieve our email newsletter containing articles, reviews and advice. You can unsubscribe to the email at any point by clicking the unsubscribe link, but hopefully you’ll find it interesting enough not to do so! What do Caravan Guard do exactly? How did you get my name? Do I have the benefit of your services – presumably as a security agency? I would take issue with the advise about damp. If you can smell damp then there is a serious problem. This requires a seal or section of awning rail to be removed and rebeded. If the caravan is over a few years old it is possible a variety of seals have started to fail. I suggest once the damp has been repaired the caravan is serviced by a main dealer in the autumn. Over the years I have replaced a lot of seals, however the last time our caravan leaked we took it to the main dealer!